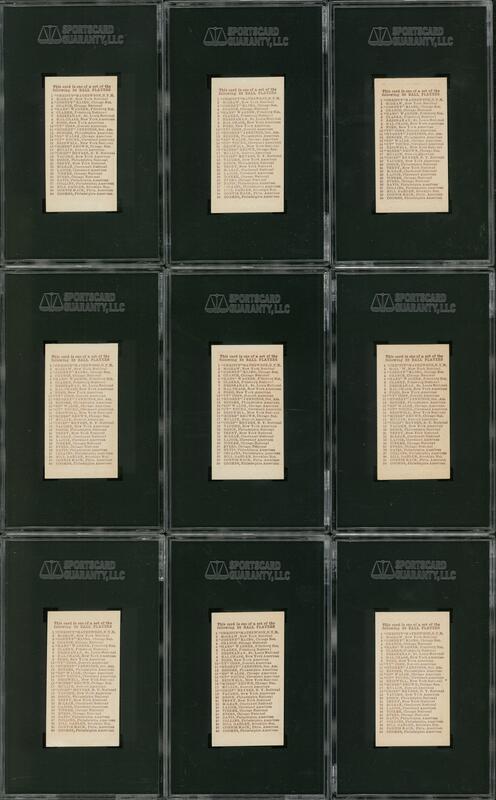 Lot Detail - 1910 E98 "Set of 30" Near Set (25/30) Plus Nine Color Variations - #1 on the SGC Set Registry! - An Incredibly High-Grade, Nationally Famous Offering! 1910 E98 "Set of 30" Near Set (25/30) Plus Nine Color Variations - #1 on the SGC Set Registry! - An Incredibly High-Grade, Nationally Famous Offering! 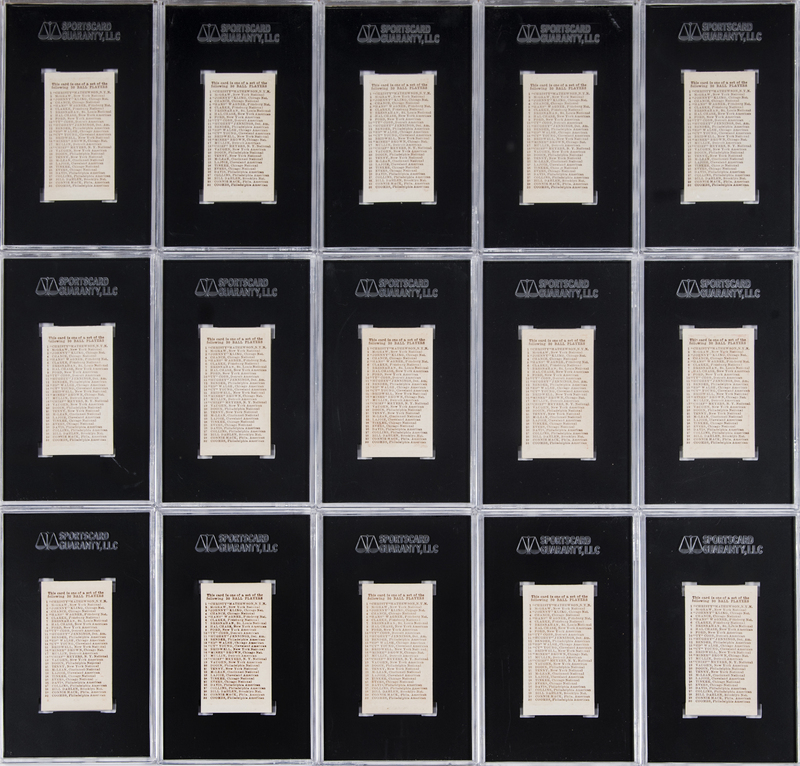 A milestone event – of a magnitude and kind that is almost unimaginable in the collecting industry – is presented in the form of this extraordinary offering. 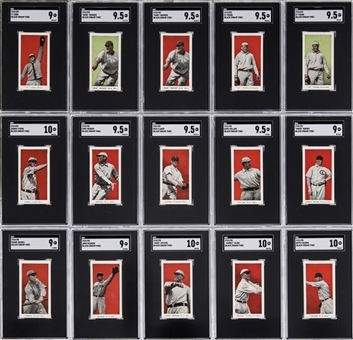 Here, ready to assume a place of honor in the hobby's long tradition of auctions, shows, and other venues, a 25-piece near set of the fabled 1910 E98 "Set of 30" baseball cards is being put forward for public sale. These cards carry a mystique that's simply unsurpassable. 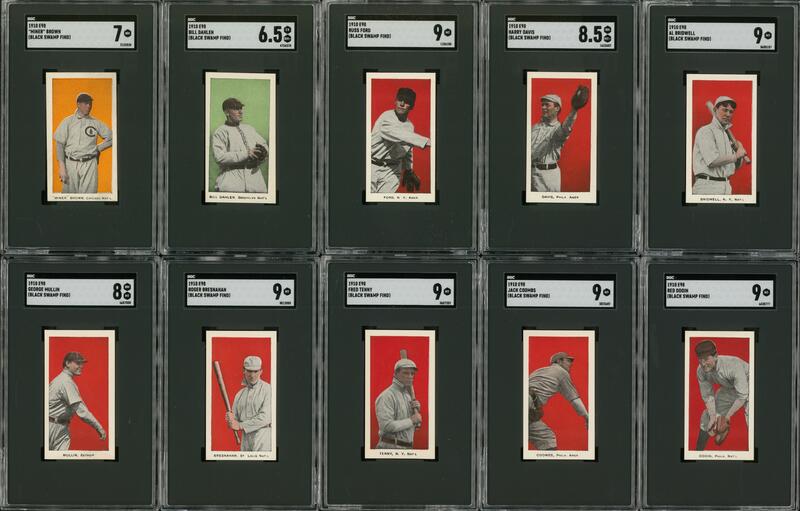 The series' player images, its origins, its limited distribution, and its impossible rarity place these very special collectibles at the pinnacle of candy-card specialists' fascination. Each card has been graded by SGC. 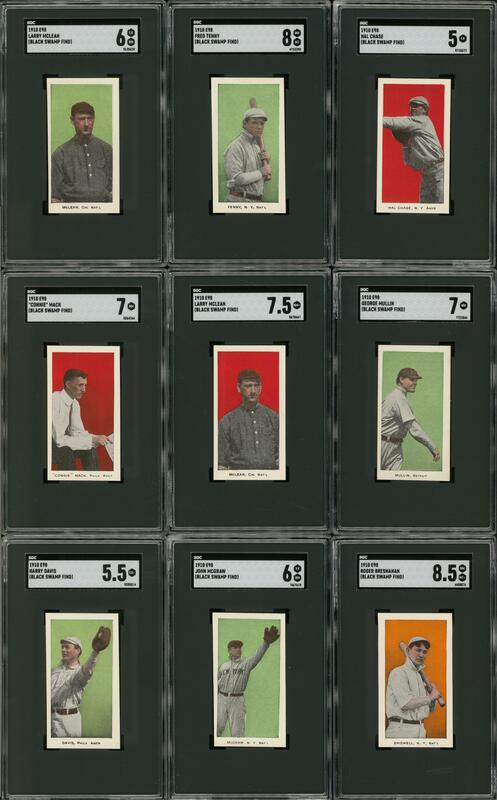 Offered here is a 25-card near set of the ultra-desirable E98 "Set of 30" baseball cards issued in 1910, plus nine additional, variation cards. 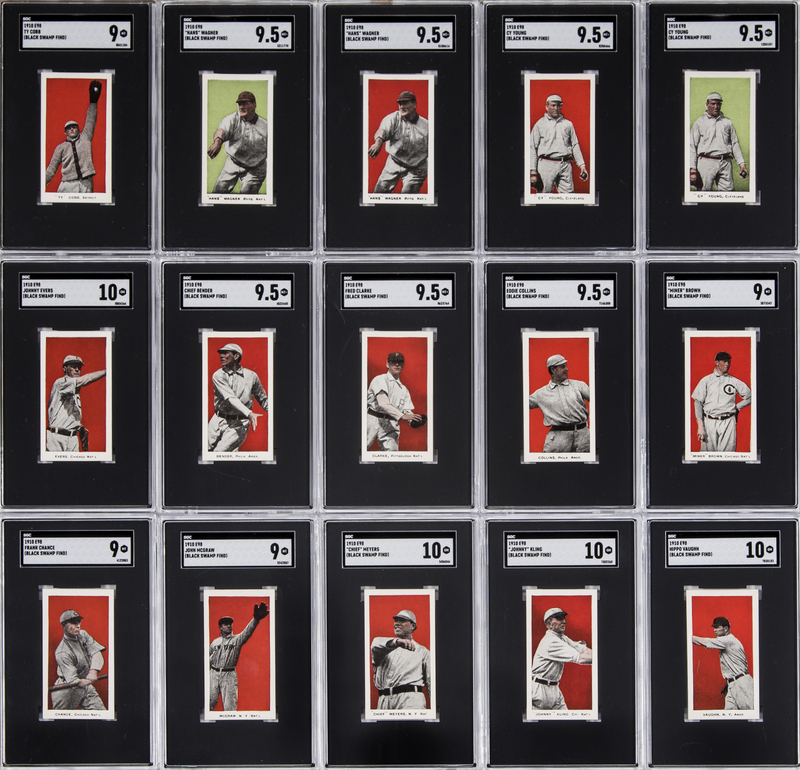 The E98 "Anonymous" issue is prized by candy card aficionados for the items' simple but bold appearance and the production's abundance of Hall of Fame players. 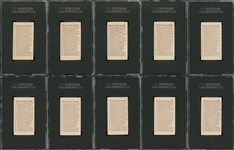 Discovered in Defiance, Ohio – and known as the "Black Swamp" find – these cards surfaced a number of years ago. Word of their emergence immediately took the collecting world by storm, owing to their incredibly high-grade state of preservation and the sheer quantity of pieces in the cache. National news media, quickly recognizing the cards' importance, spread the word of their existence coast to coast, fueling the items’ well-deserved notoriety for several weeks. Fortuitously spared from recycling or the garbage bin, these fragile paper relics had been carefully tied together, with twine, by a print shop employee more than a century ago, and that is exactly how they were first seen by a new, modern generation. When whispers of an E98 "find" were first heard, it was only natural that collectors gravitated to the most likely conclusion: the discovery would, no doubt, be an odd lot of singles. It was presumed that there would be some duplicates, probably a few stars ... a handful, with some good, some bad. Even so, that envisioned grouping would be a boon to enthusiasts who had long yearned for E98's of any stripe. No one could have seriously entertained the hope that the "find" would harbor this supreme near set of beautifully well-preserved jewels! One after another, the observer is stunned by the quality of these cards' illustrations, and the boldness of their backs. 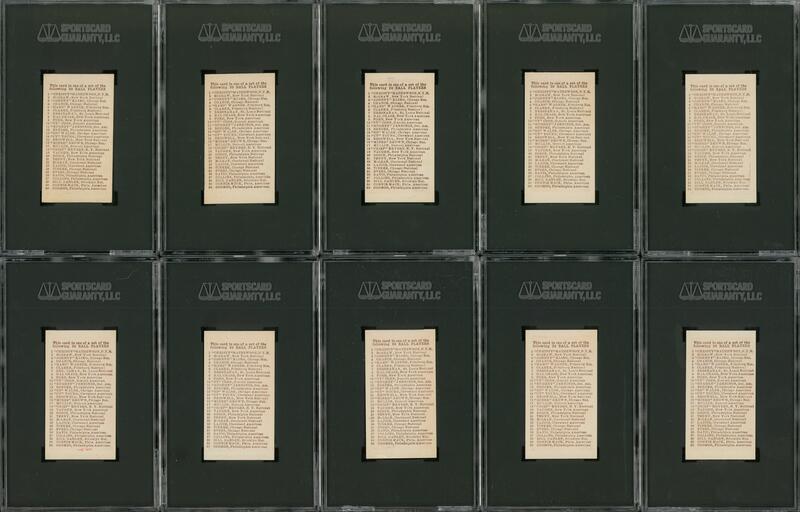 The fabulous roster showcased here is missing only Jennings, Mathewson, Lajoie, Tinker and Walsh for completion. 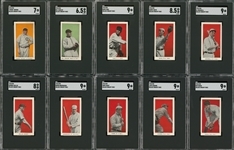 SGC GEM 10: 4 cards w/Evers (1 of 1, 53 total), Kling (1 of 1, 43 total), Meyers (1 of 2, 42 total) and Vaughan (1 of 1, 33 total); SGC MINT+ 9.5: 7 cards w/Bender (1 of 1, none higher, 55 total), Clarke (1 of 1, none higher, 42 total), Collins (1 of 1, none higher, 37 total), Wagner (1 of 1, none higher in this color, 76 total), Wagner/Green (1 of 1, none higher in this color, 76 total), Young (1 of 1, none higher in this color, 65 total) and Young/Green (1 of 1, none higher in this color, 65 total); SGC MINT 9: 10 cards w/Bresnahan (1 of 1, none higher, 48 total), Bridwell (1 of 2, none higher, 45 total), Brown (1 of 1, none higher, 64 total), Chance (1 of 3, none higher, 59 total), Cobb (1 of 4, none higher, 53 total), Coombs (1 of 3, none higher, 40 total), Dooin (1 of 1, none higher, 38 total), Ford (1 of 3, none higher, 42 total), McGraw (1 of 1, none higher, 60 total) and Tenney (1 of 4, none higher, 49 total); SGC NM-MT+ 8.5: 2 cards w/Davis (1 of 1, none higher, 50 total) and Bridwell/Orange (1 of 2, none higher, 45 total); SGC NM-MT 8: 2 cards w/Mullin (1 of 3, three higher, 53 total) and Tenney/Green (1 of 5, four higher, 49 total); SGC NM+ 7.5: 1 card, McLean (1 of 2, six higher, 45 total); SGC NM 7: 3 cards w/Mack (1 of 1, four higher, 47 total), Brown/Orange (1 of 5, six higher, 64 total) and Mullin/Green (1 of 3, six higher, 53 total); SGC EX-MT+ 6.5: 1 card, Dahlen/Green (1 of 2, two higher, 47 total); SGC EX-MT 6: 2 cards w/ McGraw/Green (1 of 4, six higher, 60 total) and McLean/Green (1 of 3, seven higher, 45 total); SGC EX+ 5.5: 1 card, Davis/Green (1 of 2, nine higher, 50 total); SGC EX 5: 1 card, Chase (1 of 2, seven higher, 42 total). In every respect, exclusivity is this marvelous near set's hallmark! The grading service's conclusions are conservatively assessed, consistent with SGC's reputation, and the SGC labels can't be expected to fully acknowledge the sheer magnetism felt upon viewing each masterful depiction. The singular gallery of E98's is magnificent, through and through, and the addition of this phenomenal near set to an established holding will immediately elevate that collection to a peerless, forever-envied status. A once-in-a-lifetime opportunity!